Even among Evangelical Protestants there is much debate about Infant Baptism. My old Baptist tradition rejected it as a Catholic tradition of men. Dr. Francis Schaeffer, my favorite Evangelical Presbyterian theologian wrote a booklet entitled Infant Baptism in favor of the practice – my wife Janet was raised Presbyterian and baptized as an infant. It continues to be a problem between Catholics and many Protestants. If you want to know more about it and why we as Catholics practice it with joy based on Scripture and early tradition, read my article here. 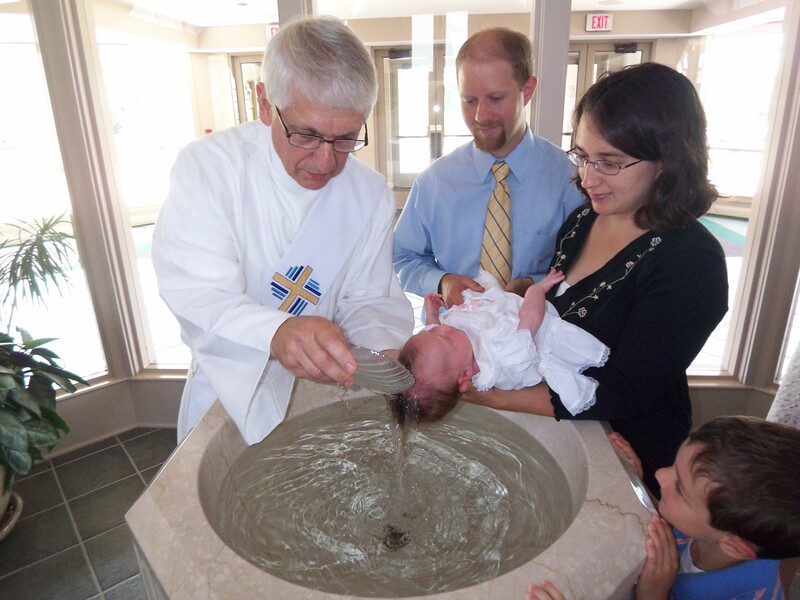 The picture is our granddaughter Elizabeth Arabella Rose Ray getting baptized 5 years ago — a little pagan becomes a Christian. thanks!– as usual, great quotes, well-written, straight & to the point! where is the “common ground” page mentioned at the end? the link didn’t work for us (could be our computer)..? I fixed the link to the Common Ground site. Use this link(http://www.shasta.com/sphaws/commonground.html) and scroll down to Infant Baptism. Its difficult for me to express, because I don’t quite understand, the opposition which many have to infant baptism. It seems to me, those who profess belief in “grace alone”, should readily embrace this doctrine. And yet, they do not. Normally, those who believe in “grace alone” also believe in “faith alone” claiming that one does not earn their way into heaven with works. Yet, they adhere to this idea that one must earn their way into heaven by “faith alone”. Otherwise, why can’t they overcome the obstacle that God is giving to our children the pure gift of deliverance, without any conditions. Certainly, adults must profess faith and prove their faith in works of love before God will justify their souls. But the promises of God are to us and to our children. That is why the Canaanite woman could pray to Jesus with great faith and her daughter was healed at that hour. And we do the same when we bring our children to the Living Water and call out His Name. Have just read your article. I was baptised aged 9 weeks: when I was 15 I attended a Baptist Church and felt the pressure to be baptised by immersion. I am now 70 and have come in the last thirty years to affirm God’s gracious hand on my little 9 week old self and thank him for my true baptism into Christ. Catholics believe baptism is necessary for salvation. In your article on Infant Baptism, it begins “Infant Baptism is a rite by which children who have not yet attained the age of reason are initiated in the Family of God—the Church. Original sin, which destroyed the life God in soul of our first parents, has been inherited by all their descendants.” It looks like there is a word or two missing from the second sentence. Would you kindly check and let us know.? We have a Baptist friend who, as you know, does not believe in infant baptism. We wanted to send him an article by a former Baptist who converted to the Catholic Church in order to see how they came to believe in infant baptism, through the “lens” of a former Baptist. We read “Crossing the Tiber,” which has an entire chapter consisting of 92 pages on baptism and infant baptism – much to long to send to him, although we have referred to the book should he care to read it. So, we saw this abridged version which we wanted to forward to him from your website. Thank you for your time and cooperation in this matter. We look forward to your reply and are prepared to amend your Word document on infant baptism.